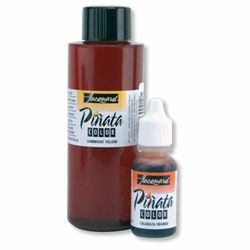 Piñata Colors are highly saturated, fast-drying alcohol inks for any hard surface, including glass, metal, plastic, ceramic, stone, leather, polymer clay and more. Indelible and impervious to water once dry, Piñata Colors clean up with alcohol and re-wet themselves, allowing for unique effects and techniques not easily achieved with water-based systems. As a dye-based, highly transparent ink*, Piñata Colors are unparalleled for vibrancy, and only the most lightfast dyes have been selected for the palette. Acid-free with excellent adhesive properties, Piñata Colors have become the go-to inks for any non-porous surface.